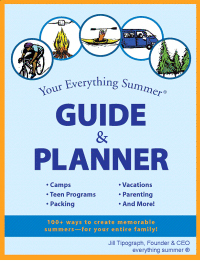 Each summer, kids look forward to overnight camp for a variety of different reasons. They anticipate exciting activities and reunions with friends, they look forward to special events and traditions, and await new privileges and opportunities that arise as they get older. However, one daily element of camp that is common to almost all programs – and one of the most important child-development tools camps have to offer – is one that is rarely mentioned as a highlight of summer. I’m talking, of course, about clean-up. Whether it is referred to as clean-up, bunk ordering, or one of a myriad other terms, tidying the cabin is an integral aspect of almost every camper’s morning. And while most campers do not appreciate this daily ritual, there is an underlying importance to clean-up that goes well beyond maintaining a tidy living space. Clean-up is a time that teaches necessary individual skills to campers – for many, this is a foundational learning experience in how to make a bed, sweep, or take out the trash – and these skills will serve them well years down the road when they are caring for their college dorms or apartments. But beyond this simple skill development, bunk ordering plays an important role within the fabric of camp – daily clean-up is a vital tool that camps use to instill a sense of accountability in campers, and a sense of group responsibility within their bunk community. As KJ Dell’Antonia notes in her recent New York Times opinion piece – “Children who help more at home feel a larger sense of obligation and connectedness to their parents, and that connection helps them weather life’s stressful moments — in other words, it helps them be happier.” This logic holds true within the summer camp family as well. By working together towards a common goal – oftentimes an ice cream or pizza party for the cleanest cabins – kids build a sense of community and accountability to one another. They lay the foundation for a relationship of trust – if you trust me to sweep the porch, and I trust you to clear the rafters, together we can clean the bunk – which helps them build lasting friendships. The stakes may not be particularly high – although ice cream-craving campers might disagree – but the lessons are valuable all the same. And, most importantly, the campers are happier as a result. And while it is natural for campers to regress a little bit upon their return home – sometimes those bed-making skills dissipate when the bedroom is their own – keeping kids invested in chores can help them continue to find happiness at home. As Dell’Antonia’s piece suggests, the presence of chores in day-to-day life can help kids continue to develop a sense of responsibility, accountability, and even empathy. So as back-to-school ramps up – and sports, homework, and other extracurriculars start to dominate the calendar – remember to have them carve out a little time for a well-made bed. They might complain, but it will serve your child well in the long run.